A Star Is Born is a 1937 American Technicolor romantic drama film produced by David O. Selznick and directed by William A. Wellman, with a script by Wellman, Robert Carson, Dorothy Parker and Alan Campbell. 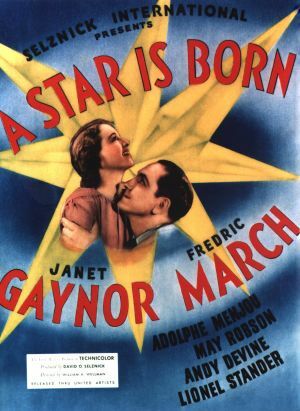 It stars Janet Gaynor as an aspiring Hollywood actress, and Fredric March as an aging movie star who helps launch her career. Other members of the cast include Adolphe Menjou, May Robson, Andy Devine, and Lionel Stander. Contemporary reviews were very positive. Frank S. Nugent of The New York Times called the film "one of the year's best shows" as well as "good entertainment by any standards, including the artistic, and convincing proof that Hollywood need not travel to Ruritania for its plots; there is drama aplenty in its own backyard." At the 10th Academy Awards, A Star is Born was nominated in seven categories, winning in one. Wellman won the award for original story, the only Oscar he was to win during his career. W. Howard Greene received an honorary Academy Award for the film's color photography; this award was recommended by a committee of leading cinematographers after viewing all the color pictures made during the year.